Here I am, in Germany. Finally. I have decided to revive my use of this blog (to which I have seldom posted of late) as a general means of communicating my experiences to you, my faithful reader, as I make my way through the next 10 months as a Fulbright student at the Westfälische Wilhelms Universität in Münster. Here will be collected anecdotes of various kinds, updates on this or that, and my thoughts (as you should have been able to expect) on the goings on--here, in the world at large, and at home (for I continue to receive The Heights via email every Monday and Thursday: so you should also expect a diatribe from time to time on the decline and fall (since I am no longer there) of Boston College, or conversely its rise to ever greater things from the generation to come). 1. The group was accompanied by 2 teachers, one man and one woman. The man, though the physical resemblance would end at "glasses and a beard", nevertheless bore a striking mental resemblance to my father, for when he once was walking up and down the aisle checking on his students, a smile graced his face as I have seen any number of times on the visage of my own father as he gazes upon his students--enveloped perhaps in their own little world, but little spheres of budding curiosity and learning and life all the same. 2. The particular group of 4 girls who sat directly in front of where I stood those two hours did, at one point in the journey, have an argument concerning the proper pronunciation of the word "Lufthansa". Three of them seem rather bemused that one insisted on pronouncing it "Luf-thansa", for the proper German pronunciation syllabifies the word according to its component words, "Luft" and "Hansa" (so "Luft-hansa"). This poor girl, however, had fallen prey of the same tendency that governs the American pronunciation of the term, namely, to maximize the onset of the middle syllable, thus moving the "t" sound from the first syllable into the second. All of which did pass through my mind, at which point I realized that the lingustics class that I took last year from Prof. Michael Connolly had completely ruined me for life, as I know he well intended. We return, then, to the Orientation. I'm sure that all would agree that by the far the best part of the entire orientation experience (apart from the lengthy, oft stupefying yet invaluable information sessions that answered such important questions as "How do we get paid?") was getting to meet the other Fulbrighters and query them on their respective projects - indeed, for that endeavour I wish we'd had another day, for I didn't get to talk to everybody. Of particular interest to me was that the Fulbright Commission seems to have been on a medieval women kick this year, for in addition to my project on the 13th century reception of the apocalyptic works of the 12th century abbess and visionary, St. Hildegard von Bingen (of whom you will hear quite enough in the course of this year), two women have also been given grants to study female medieval authors. The one, who is working on her doctoral dissertation at Northwestern (and who is very well acquainted with several of the profs with whom I hope to start working next year at the University of Notre Dame), will be in Munich investigating apocalyptic writing of the 14th and 15th centuries - a few centuries after my time, but a project to which Hildegard is fundamental. 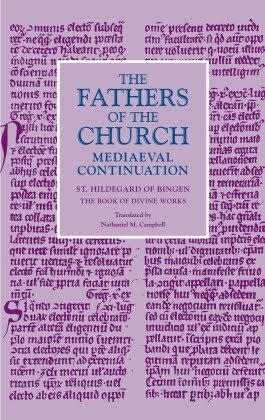 The other, finishing her masters work at Tufts, is working (also in Munich) on several chronicles written by German nuns of the 13th and 14th century - again, past my time but yet very much bound up with the after-history of Hildegard. I had been looking for an excuse to return to Munich anyway (I loved the city when I lived there for 2 months almost 2 years ago), so now I have it - I imagine we all shall visit several times before the year is up to collate and talk shop. Alas, Wednesday morning the fun had to come to an end, and I had to make an uncomfortably early exist from Göttingen (the train left at 7:45) in order to get to Münster in time to get the paperwork for my dorm room in order (the offices of the Studentenwerk--their equivalent to an Office of Residential Life--are only open Tuesday through Thursday, 9am-12pm; such is the way of most every German office that one should need to visit). A few taxi rides later (I accidentally went to the wrong building on my first try), I had succeeded in securing a room for the next year. It's a single room with a bed, desk, shelves, closet, refrigerator, and sink, and their are common bathrooms and a common kitchen on each floor. Perhaps not the greatest of accomodations, but at only €190 a month, I'll take it. After settling into my room, I've spent the last few days wandering around the city, my philosophy being that the best way to learn your way around is to get a map, get yourself intentionally lost, and then find your way home. A misunderstanding concerning the bus routes meant that I had to walk most of the way home on Wesdnesday night, but all in all, I'm really starting to get a good feel for the place--and my dorm is only about 3.5 kilometers outside the city center. I would call it a city on the small side of medium--larger certainly than was Eichstätt, but not nearly so large as was Munich. It has a beautiful inner city jampacked with an assortment of now-to-be-expected medieval, baroque, and 19th century buildings, their ground floors now filled, as with any modern city, mostly with high-end fashion and other boutiques far out of the reach of my pocketbook; it's own share of impressively outfitted churches (enough to fulfill my pentient for "church-hopping") with the standard array of architectural styles and enough Masses per day to accomodate most any schedule; and a delightful greenbelt that runs the permeter (the remains of the mote and ramparts that surrounded it in less collegial times), through which I have not yet had the pleasure to stroll but to which I eagerly look forward. Finally, I made my way today into the heart of the university (as with most German universities, its campus is indistinguishable in most places from the city), which is to be found on the grounds of the great baroque Schloß, or palace, that was built there when a nobleman still ruled these parts--a wonderful walk now through many acres of manicured gardens. Now that impressive building houses various offices of the university, including, in a side building off to the north, the International Office, where I stopped this morning to clear up a few things, most especially the fact that, according to the Letter of Admission from the university, I was registered as a woman. Not a problem, said the very kind Frau Bobke, who then called up Herr Friedmann (off their version of an Office of Student Services) and, after a telephone conversation that happened too fast for me to follow, she whisked me to his office (in the great palace itself--the interior unfortunately no longer matching the baroque majesty of the exterior), where he not only was able to change my gender in their computer system but also was able to complete all the other paperwork to get me officially matriculated, a process that, had I not inquired, would have taken until the 10th of October to complete. Along with the matriculation number that I now possess come several delightful benefits: a semester pass for the bus system; a catalogue of courses (so that I can finally figure out what I'm going to take); and a username and password (which should come in the mail next week) for the university's computer centers--a relief from having to pay for access at an internet cafe. And that brings me to the title of this post: it would seem (or so the signs said, and the heavy press and police presence would confirm) that the Dalai Lama is visiting this very university today. As a commentary on the experience thus far or to come, perhaps it should serve as a reminder of two things: (1) fascinating and unexpected things await me, and (2) as exciting as this week has been for me, there are far more important things going on in the world. A dichotomy to make a medievalist proud, both uplifting and humbling, both energizing and subduing. So there it all stands: less than week down, and many chores already complete. Time now, I think, to go the bookstore, find something suitable to wile away the weekend, and settle down on a nice bench in a park somewhere.